This little cabin has been constructed in the lower level of my log home. This cabin is fully equipped. It has a full kitchen with stove and refrigerator, a full bathroom with full shower, a bedroom with a queen size bed that includes all the bedding (linens, blankets and pillows). The living room has a recliner chair as well as a sleep sofa which can sleep two. The living room also has a TV with full cable. It has WiFi for your convenience (Password will be given once your stay has been secured). It has full heat for winter and cold AC for the summer. The kitchen has all complete cookware, glasses, coffee mugs, utensils, a coffee pot with coffee, powdered cream and sugar. You have your own private entrance. A lock box hangs to the left of the entry way with the cabin key in it. Once your getaway is confirmed you will be provided with the combination. This is an exceptionally quiet neighborhood. This is not a party house. It is not suitable for children. I am pet friendly for a number of reasons. I have traveled with my pets for 30 years and have always found it difficult to find pet friendly places. Most pets are considered family members and most pet owners enjoy traveling with their pets. 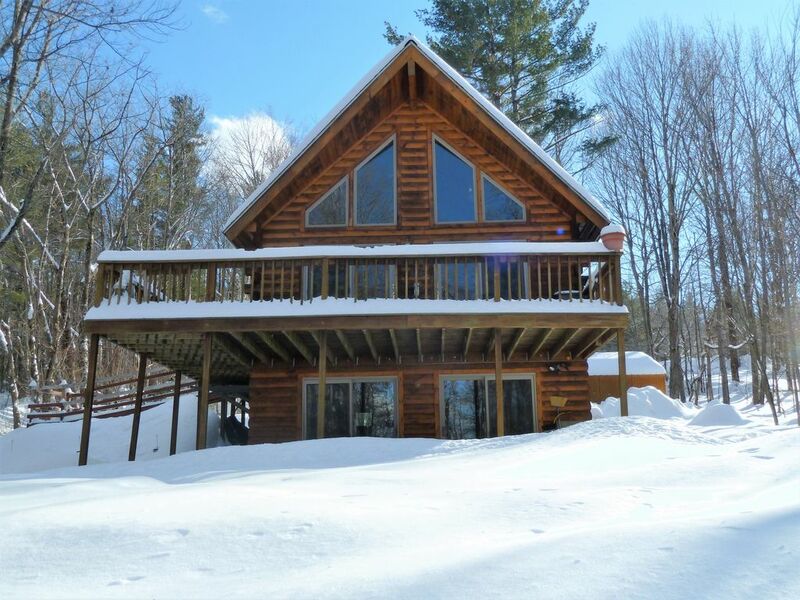 This property is 1/2 mile off Kancamangus one of the most scenic roads in the US. There are countless hiking trails that range from very easy to very difficult very close by. Biking, canoeing, kayaking, skiing (X-country and alpine), horseback riding and golfing are just a few of the many activities close by. For those less enthusiastic about the great outdoors, the infamous "outlet shopping" stores are a short 10 minute drive. The Conway Scenic Railroad is a five minute drive. North Conway has numerous restaurants which is a short 10 minute drive. Darby Field Inn is a stones throw from the little cabin. The apartment was very cozy. Perfect for us and our dog. We went on a couple hikes and just simply relaxed. Minutes off of the Kangamanas highway which we took advantage on our ride home. This vrbo was perfect for us! Our dogs were right at home and the location was spot on for some good winter hiking. Thanks to Marianne for providing such cozy quarters. Simply loved this beautiful inviting place. Would suggest handrail and better lighting for stairway. Marianne's place was perfect. It had everything we needed and was very cozy. Loved the little touches she added, for instance, the boot dryer, ear plugs, dog bowls, dog bed and towels for the pups! Marianne was wonderful to let us extend our stay a day. We had planned to drive elsewhere the next day but the cabin was so cozy and close to town, it was hard to leave. The place is very peaceful, and it was easy to find after a long day leaf peeping on the Kancamangus. Thanks Marianne! Darby Field Restaurant and Tavern a stones throw from the cabin.